A spring company dedicated to manufacturing wire springs by using spring making machinery that shapes round wire into adjacent helical coils. Acxess Spring is a wire springs manufacturer specialized in the manufacturing of round wire, coiled, helical springs. Amongst all types of springs, we manufacture wire compression springs, wire extension spring, wire torsion springs, an many other custom types of springs which derive from these basic springs types. These include wire conical springs, wire barrel springs, and wire compression torsion springs. As wire springs manufacturers we also include many material types. These material types vary from Music Wire ASTM A228 and Stainless Steel 302 A313, which are the most common, to Stainless Steel 316 A316 and Phosphor Bronze Grade A B159, which are more rare material types. Not only do we manufacture wire springs, we have also created innovative technology to design these wire springs. 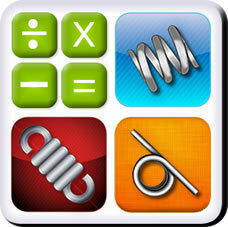 We have the most advanced and easy-to-use spring calculator on the web, Spring Creator. It is able to calculate the design of the three basic wire spring types; compression, extension, and torsional wire springs. All you need to do is enter the spring’s physical dimensions and pick a specific material type for Spring Creator to automatically calculate values like spring rate. No spring calculator on the web is able to do this with nothing but your wire spring’s physical dimensions. It doesn’t stop there, though. Spring Creator will also provide you with a live blueprint of your wire spring design thus showing you a proportionate image of how your spring will look like. The blueprint comes with the full spring analysis you’ve already generated and you are able to email it to either yourself or a comrade. It also has features that help the spring engineers and spring makers like the weight per thousand and the length of wire required to make the spring. This helps us to know how much material will be needed to fulfill your wire spring order. Spring Index will also tell us the manufacturing difficulty of your spring design. As wire spring manufacturers, we have made your spring shopping a lot easier too! Now with The Spring Store, our online stock spring store, you are able to shop for stock springs similar to your design and avoid waiting on the longer lead time it would take to manufacture your springs. With The Spring Store you are able to purchase your stock wire springs that same moment and prepare to receive them within a week of the time you made the purchase. Use Spring Finder to find the stock wire springs similar to your wire spring design.